The grave and its offering pit, located adjacent the Bronze Age city of Hala Sultan Tekke, contained many fantastic gold objects such as a diadem, pearls, earrings and Egyptian scarabs, as well as more than 100 richly ornamented ceramic vessels. The objects, which originate from several adjacent cultures, confirm the central role of Cyprus in long-distance trade. According to Fischer, the painting of the woman’s dress is highly advanced and shows how wealthy women dressed around this time. The motif can also be found on frescos for example in the Palace of Knossos in Heraklion, Crete. Other finds are from Egypt. 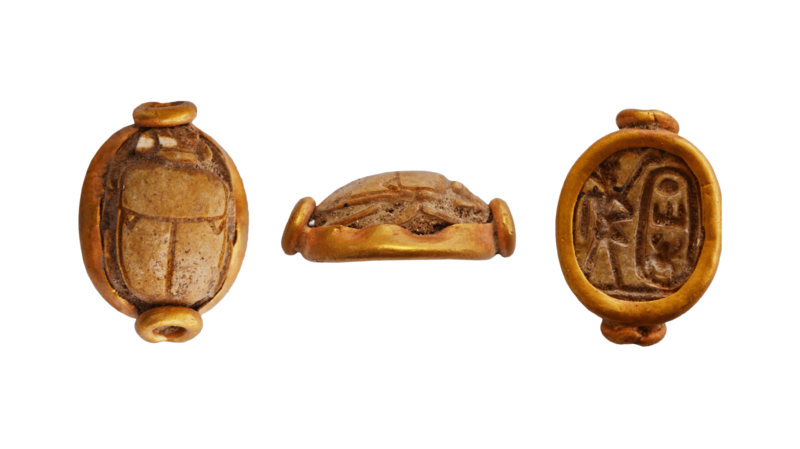 Two of the stone scarabs are gold-mounted and one features hieroglyphs spelling ‘men-kheper-re’ next to an illustration of a pharaoh. This has given the archaeologists a unique opportunity to tie the roughly 3 500-year-old find to a historic person. The inscription refers to Egypt’s most powerful pharaoh Thutmose III (1479–1425 BC), during whose reign Egypt peaked in size and influence as he conquered both Syria and parts of Mesopotamia, present-day Iraq.